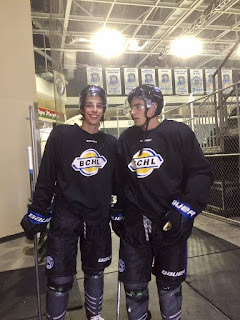 Quinnipiac recently picked up a pair of commitments from two Quebec born players in Christophe Fillion and Christophe Tellier who are currently playing for the Wenatchee Wild in the BCHL. Natives of Sherbrooke, Quebec they have taken the path to play with each other at multiple stops and are set to do it again as Quinnipiac Bobcats starting in the 2020-2021 season. I had a chance to catch up with the both of them for a Q&A about many different things including their recruitment, hockey in general and off the ice as well. Thanks to both of them for taking the time to do this. @QHockeyBlog: First off congratulations to the both of you. What are your emotions like for the both of you after making the decision to commit to Quinnipiac? Christophe Fillion & Christophe Tellier: Both of us are really excited to join the Bobcat family. It has always been a dream for us to play college hockey together. @QHockeyBlog: Tell us about your overall recruiting process? Has Quinnipiac been following you both for awhile? Christophe Fillion & Christophe Tellier: Yes, I believe they have been following us for quite awhile. I know that when we both played in Iowa with the Iowa Wild AAA program they came to a few games. Obviously, this year, they have been to a few games and associate coach Joe Dumais probably watches all our games online too. @QHockeyBlog: Did you have a goal of playing together in college? Christophe Fillion & Christophe Tellier: Yes we did. Every team we would talk to we would tell them that we were a package deal. @QHockeyBlog: What other NCAA schools showed interest in you and did the fact that you came together as package deal scare some programs away? Christophe Fillion & Christophe Tellier: Two schools that showed a lot of interest were the University of Nebraska-Omaha and Minnesota State at Mankato. The fact that we came as a package deal probably scared a few schools away, but we don’t really which ones. @QHockeyBlog: With you both from Sherbrooke, Quebec what was the reason you both went the NCAA path as opposed to many in the province who go major juniors in the Quebec Major Junior Hockey League? Christophe Fillion & Christophe Tellier: We decided to take the college route instead of playing major junior because education is really important for both of our families. If hockey doesn’t work out for us after college, well we will still have a great education and we will be able to get an excellent job down the road. @QHockeyBlog: I asked this to your fellow province-man and future Bobcat teammate Yaniv Perets but why don’t we see more kids from Quebec go the NCAA route? Christophe Fillion & Christophe Tellier: At a young age, I feel like a lot of kids say they want to play college hockey, but as soon as they get interest from a QMJHL team, they show up to a camp thinking they are going to make the team and they loose their eligibility. @QHockeyBlog: Two part question one for Christopher Fillion and one for Christophe Tellier. What are your strengths currently as a players? Christophe Fillion: For me, I would say that my hockey sense and my scoring instinct are my strengths. Christophe Tellier: For me, I would say that I have a play-making instinct and that I have pretty good stick-handling abilities. @QHockeyBlog: What went into your decision to play junior hockey in the BCHL as opposed to say the NAHL or USHL where you Christopher Fillion played two games last year? Christophe Fillion & Christophe Tellier: We decided to play junior hockey in the BCHL because it is a really good offensive league and we thought it would be a better fit for us. @QHockeyBlog: Within the next year and a half prior to coming to Quinnipiac University for the 2020-2021 season, what do you both want to improve upon as players? Christophe Fillion & Christophe Tellier: We probably both want to just become better athletes and work on our defensive game. @QHockeyBlog: Who to this point in your lives has been the most influential in getting you to this point for an NCAA Division I opportunity? Christophe Fillion & Christophe Tellier: For both of us, I would say that our parents are a huge part of our success because of all the support they have given us over the years. 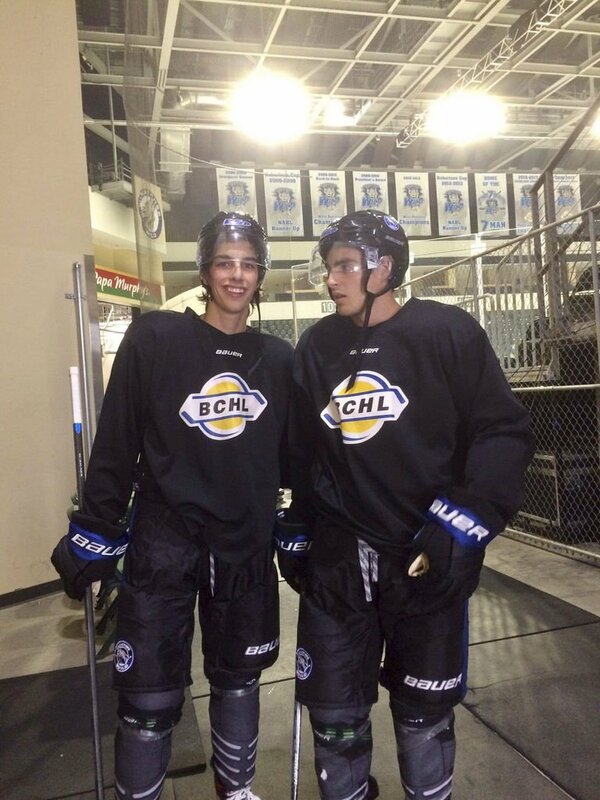 @QHockeyBlog: Off the ice what are some of the things that you both like to do when you are not playing hockey? Christophe Fillion & Christophe Tellier: Off the ice we both like to golf once in a while. I (Fillion) was actually on the golf team at my prep school so I am pretty good at it. Also, we like to play video games. @QHockeyBlog: Final question and I asked this same one to Yaniv Perets as well. With me being a Boston Bruins fan obviously Montreal is our hated rival but I’ve been to the Bell Centre for a Bruins and Habs game and I’m not sure there is another arena that can match that atmosphere. Is this something you would agree with and are both of you big fans of the Canadiens? Christophe Fillion & Christophe Tellier: Yes we agree. We have been to quite a few Montreal Canadians games and it is hard to beat. Everyone is just so loud!